As a young boy, Kyle (Chaney Kley) claimed to have seen the tooth fairy. He also claimed she tried to kill him. Now over twelve years later, Kyle has left the town that never believed him. He has also left behind the two people who thought he was telling the truth, his childhood girlfriend Caitlin (Emma Caulfield) and her younger brother. And when evil again emerges in Darkness Falls, Kyle must return to do battle with the winged creature of doom he saw that night so many years ago. Because evil isi ack with a vengeance. And it's not leaving without Caitlin's brother. Opening weekend $12.024 million on 2837 screens. 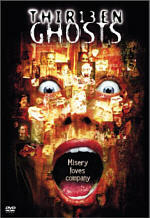 Rated PG-13 for terror and horror images, and brief language. All of our other childhood heroes (Santa, Jack Frost, and even a Leprechaun) have all had horror send-ups in the movies, so why shouldn’t the Tooth Fairy? In Darkness Falls, that’s exactly what happens, as the Tooth Fairy is transformed into a murderously ruthless specter. Even though you may have never seen the Tooth Fairy in a starring role in a horror film, you’ll get a sense of déjà vu as you’re watching Darkness Falls, as the film is full of recycled plays out of the “standard horror film” playbook and amazingly, it took three screenwriters to come up with the story. The film is totally predictable at almost every turn and while almost completely unoriginal, Darkness Falls still manages to entertain. First time director Jonathan Liebesman manages to generate at least a degree of suspense and a few unexpected diminutive shocks in his freshman effort. Through a sepia-toned history lesson that opens up the film, we learn about the New England town of Darkness Falls (where the centerpiece of the town just so happens to be a lighthouse), where over 150 years ago, an old lady by the name of Matilda Dixon earned the nickname of “Tooth Fairy” by giving gold coins to kids who gave her their baby teeth. Unfortunately, Matilda had a string of bad luck that would lead to her house burning down and she became horribly disfigured in the process. It was so bad – and her skin was so sensitive to light – that she was forced to move around only at night and only while wearing a porcelain mask. Then, when a couple of kids came up missing, the town accused her of killing them and an angry mob drug Matilda from her home, ripped off her mask, and hanged her and with her dying breath, she put a curse on the town. The day after her execution, the kids showed back up – alive and well. Flash forward a hundred or so years and we meet a young Kyle Walsh (Joshua Anderson) who just lost his last baby tooth and has learned of the local legend of the marauding Tooth Fairy’s final visit to his home. Unfortunately, Kyle learns that the legend is true and as he places his tooth under his pillow, it has the effect of summoning Matilda from the dead. Shrouded in black, with a cracked, white porcelain mask over her face, she zooms through the air, swooping down to terrorize the Kyle, who can only keep her at bay by being in some form of light. It seems that the Tooth Fairy doesn’t appreciate anyone gazing upon her face – and if you’re caught doing it, she will hunt you down until you’re dead and have appropriately paid for your sin. We learn that her only weakness is a strong sensitivity to any form of light and that’s how Kyle was able to keep her from killing him. However, when her violent visit ends in his mother’s death, Kyle is blamed for the murder and sent away. The film then takes another jump – this time only twelve years ahead – and we meet an adult Kyle (Chaney Kley) who’s living in Las Vegas and keeping it together with lots and lots of medication. Still scarred from the incident in Darkness Falls, Kyle knows that the Tooth Fairy won’t give up until he’s dead and because of that, he keeps a massive supply of flashlights and batteries … as well as backup flashlights and batteries … that he can take with him wherever he goes. He decides to go back to Darkness Falls when he gets a call from his childhood friend, Caitlin (Emma Caulfield), and he learns that her little brother, Michael (Lee Cormie), is being haunted by the same Tooth Fairy that Kyle saw as a child. Kyle works with Caitlin and Michael to help them understand these horrific visions and Kyle must keep the doctors away from Michael, as they don’t understand or believe the realism or severity of what’s happening to Kyle. This is all going on while the group is fighting the Tooth Fairy as she occasionally swoops in and out of Darkness Falls and attacks when the lights go out. 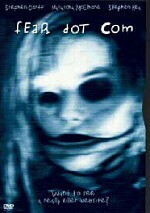 Darkness Falls isn’t really scary or terrifying, but it definitely contains its fair share of chills and thrills. The film doesn’t take itself too seriously and throws in a few lines to remind you of that fact. The PG-13 rating means that much is left to the imagination and the film is definitely low on the gore factor – and it’s buoyed by the fact that the majority of the action takes place in almost complete darkness and at times, there is more unseen than actually seen. Ultimately, this is a film that mom and dad can watch with the older kids or feel safe letting their kids watch at a weekend sleepover. You won’t hear Darkness Falls mentioned at the Oscars for sure, but it’s not worthy of a “Razzie” either. Enjoy it for what it is – a cheap thrill that don’t require much thinking on your part. Columbia presents Darkness Falls in a nicely done anamorphic widescreen transfer in the film’s original theatrical aspect ratio of 2.35:1. There is also a fullscreen version of the film included on the same disc (and same side) and you are given the option of picking which one you want to view when you pop the disc in your player. Obviously, the widescreen version is the more preferred one and the only one that I’ll be checking out for the purposes of my review. As expected for such a recent release, Columbia has handled the transfer quite well and the DVD transfer seems to have been dubbed from a pristine master. The film contained a rather dreary and muted palette, as 99% of the film was shot in dark interiors/exteriors and therefore, it’s hard to say what really looked good and what didn’t. However, I don’t guess it really matters since everything was properly balanced and contrasted. The black levels in the film were very deep, dark, and foreboding and there was never any murkiness in the image at all and while sharpness seemed to take a hit in a couple of places, the film displayed excellent shadow detail and delineation at all times. Flaws with the print were minimal, as there was a slight amount of grain that permeated a few of the darker scenes, as well as a couple of instances of compression artifacting. Columbia has packed a lot on to this disc (two versions of the film and two commentaries for starters) and I would think that the artifacting could have been resolved has Columbia reserved a bit more room for the widescreen transfer. Print flaws and edge enhancement were nowhere to be seen, nor were any other mentionable flaws. In the end however, none of the aforementioned issues distracted from the film one bit and Darkness Falls managed to remain a very fine transfer. Darkness Falls is a fine looking transfer and fans of the film or nitpicky reviewers won’t find a whole heck of a lot to complain about. This is one very good-looking transfer. Columbia has given Darkness Falls a rather decent Dolby Digital 5.1 transfer in English, as well as French. True to most large budget horror flicks from major studios of late, the audio transfer is quite spectacular and does a nice job of engaging your surround setup for a good portion of the film. Darkness Falls contained some quite bombastic moments throughout the film and the majority of them were usually reserved for the Tooth Fairy and whatever havoc she might be causing at the time. There were other active occasions noted during the film and the remainder of those seemed reserved for “cheap thrill” type moments where the soundtrack was purposely loud and belligerent in order to induce jumpiness in the viewer by the sheer decibel-level of the mix. The rear surrounds get in on the action as well and the film was able to create quite an enveloping and atmospheric mix that at times, could be very creepy. Effects in the film were very crisp and clean and the track displayed impressive directionality and split surround usage throughout. The .1 LFE was given plenty of work to do in Darkness Falls and the bass literally rumbled to life on more than its fair share of occasions. The low end heard in Darkness Falls was quite impressive and was definitely the kind that would rearrange your furniture if you weren’t sitting in it to keep it grounded. This film easily contained some of the most impressive low-end I’ve heard in quite some time. Dialogue was crisp and clean for the most part, although there were a few moments where it was a bit piercing and harsh comparatively. Not a showstopper by any means, but noticeable nonetheless. Rounding out the audio package were English and French subtitles, as well as English Closed Captions. Darkness Falls was a surprise hit in Columbia’s stable this past year and they have topped it off with a nice package of supplements for the Special Edition DVD. However, I’m sure your enjoyment of the supplements will be directly related to how much you enjoyed the film itself. The extras start off with two audio commentaries, with the first being a Commentary With Director Jonathan Liebesman, Producers William Sherak and Jason Shuman and Screenwriter James Vanderbilt. This was a totally engaging and consistently active commentary and with so many participants, there’s never really a chance to catch your breath. This first commentary covers everything imaginable pertaining to the film’s production, as we learn about how the team came about the initial idea for the film and the development … and subsequent changes to … the script. Between all the jokes and wisecracks (these guys obviously had a good time making the film together), the group also manages to discuss casting the roles for the film and the actors who participated, effects that were used in order to pull off certain shots, sound design, horror clichés and homage’s to other movies included in Darkness Falls, and so on. You name it – they cover it in this commentary – and regardless of your thoughts on the film, they manage to make you enjoy the commentary regardless. Very well done and very entertaining. 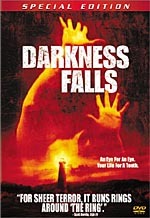 Next is a Commentary With Writers John Fasano and Joseph Harris and while not quite as enjoyable as the first, it does a really good job of filling us in on all of the iterations that Darkness Falls took on during the screenwriting process – especially the Tooth Fairy herself. There were all kinds of different scenarios tossed around about how the Tooth Fairy would act/strike before what was finally decided upon in the finished product. The duo also does a nice job of explaining the process of developing a screenplay and seeing it all the way through to the big screen – changes, edits, and all – and they proceed to make obvious comparisons between their film and others in the genre. All in all, not a bad commentary, but not quite as entertaining as the first. Next up are close to 10-minutes of Deleted Scenes that are presented in an untouched widescreen format, complete with time-codes and all. The scenes included are “Young Caitlin's Necklace” (1:17), “Dr. Murphy's Advice” (1:02), “Kyle Decides to Help” (0:46), “The Specialist” (0:36), “Dr. Murphy Sticks with the Group” (0:30), “Hallway of Lights” (3:30), and finally, “Final Confrontation” (1:55). The majority of these scenes were rightfully shortened and/or cut from the film, as they offered nothing more than useless extensions of scenes and plot points that were already understood from the included footage in the feature itself. From listening to the commentaries, I’m quite sure there’s more than 10-minutes of footage lying around, but even so, what’s included was a nice inclusion to the set. Next up are a couple of Featurettes, with the first being The Legend of Matilda Dixon (10:45). Whoever thought of this, let me simply start by saying that it was a bad, bad idea. Unfortunately, what this featurette tried to do is come up with some sort of “Blair Witch” backstory to the legend of the evil Tooth Fairy that’s presented in Darkness Falls. This expose takes place in “Port Fairy, Australia” and we’re presented with some really bad actors who pretend like this legend is for real and it emanates and originates from their town. Unfortunately, this extra is only good for the unintentional comedy that it provides. Finishing off the extras are some Storyboard Comparisons for three scenes in the film – “Larry Dies” (1:29), “The Elevator Scene” (1:47), and “Final Confrontation” (1:02). Nothing you haven’t seen before or done better. In this setting, the storyboard plays in a window that takes up about 2/3 of the screen in the top left-hand corner, while the scene from the film takes up the remainder of the space on the screen. There’s no -ANGLE- button usage here, as all we can do is watch the scene and its corresponding storyboard. No big whoop. Not a bad set of supplements by any stretch and fans of Darkness Falls should feel honored that Columbia has graced this film with so many goodies. There’s some definite cheese included here, but that’s what most mainstream horror flicks are anyway – recycled and constantly regurgitated cheese. Darkness Falls was full of clichés and formulaic horror film staples, but I found myself pleasantly surprised at how much I actually enjoyed it. The film has its fair share of thrills and chills and while far from horrific, it’s a slick-looking, big budget affair that at the very least, manages to entertain. Columbia has done a bang-up job on the DVD and provided viewers with a absolutely solid video transfer, a bombastic audio transfer, and some nice supplements to boot. Fans of the film and of the genre should jump all over this when the DVD streets and for everyone else, a weekend rental is in order, as Darkness Falls provided a decent little thriller.